When connected in series to the main power rail, it protects the load against over-current and over-voltage. Voltage is clamped to a user-defined maximum, preset with external resistors. Excessive current is restricted to the programmed safe limit by controlling the internal power mosfet, and folds-back to a lower limit if a heavy over-current or short-circuit is detected. The device is made using the firm’s BCD8 high-voltage process and integrates a 30mΩ VIPower mosfet. Features include dV/dt control to prevent excessive in-rush current at start-up or hot-swap insertion. 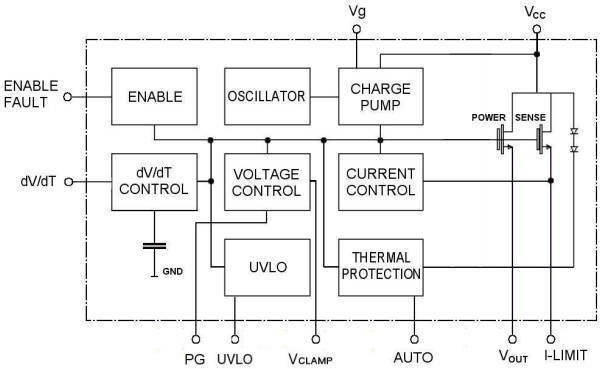 “This slows the output-voltage ramp-up time to at least 3ms, which can be increased if desired by connecting an external capacitor.”, said ST.
Under-voltage lock-out (UVLO) can be set using external components to suit the load requirements. 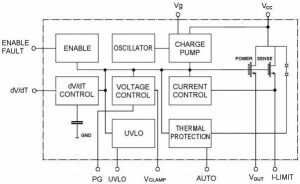 Then there is thermal shut-down, with a choice of latching or auto-retry, and maximum dissipated-power protection to protect the device from damage when starting loads with large capacitance, or during large load transients, or short-circuits at high voltage. A power-good indicator and an enable/fault pin allow for status monitoring and control of the the device. Should reverse current protection be required, a gate-driver has been built in to feed an external mosfet. It comes in a 14pin HTSSOP14 package, operation is over -40 to 125 °C, and the STEF01 is intended for applications including: industrial hot-swap boards, industrial control equipment, circuit breakers, power busses, security systems, lighting, telecoms power, or distributed power systems.